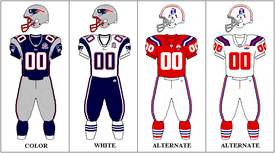 The 2009 New England Patriots season was the 40th season for the team in the National Football League and 50th season overall. They finished with a 10–6 record and a division title before losing to the Baltimore Ravens in the playoffs. ↑ Gasper, Christopher L.; Reiss, Mike (January 14, 2009). "Patriots lose Pioli to Chiefs". The Boston Globe. Archived from the original on January 19, 2009. Retrieved February 17, 2009. 1 2 Reiss, Mike (January 27, 2009). "Floyd Reese analysis". Boston.com Reiss' Pieces. Archived from the original on March 4, 2009. Retrieved February 17, 2009. 1 2 Reiss, Mike (February 13, 2009). "Patriots promote Waldron". The Boston Globe. Archived from the original on February 16, 2009. Retrieved February 28, 2009. ↑ Reiss, Mike (February 25, 2009). "Licht hired in personnel department". Boston.com Reiss' Pieces. Archived from the original on February 26, 2009. Retrieved February 25, 2009. 1 2 Reiss, Mike (July 21, 2009). "Coaching & scouting nuggets". Boston.com Reiss' Pieces. Retrieved July 21, 2009. ↑ Reiss, Mike (January 12, 2009). "Patriots coordinator McDaniels to coach Broncos". The Boston Globe. Retrieved February 17, 2009. ↑ Gasper, Christopher L. (January 22, 2009). "Patriots promote O'Brien". The Boston Globe. Archived from the original on February 28, 2009. Retrieved February 17, 2009. ↑ Reiss, Mike (February 24, 2009). "O'Shea expected to be named WR coach". Boston.com Reiss' Pieces. Archived from the original on February 28, 2009. Retrieved February 24, 2009. ↑ Reiss, Mike (January 15, 2009). "Seely's move not lateral". Boston.com Reiss' Pieces. Archived from the original on February 20, 2009. Retrieved February 17, 2009. 1 2 3 "Patriots hire O'Brien as special teams coordinator". The Boston Globe. Associated Press. February 3, 2009. Retrieved February 17, 2009. ↑ Reiss, Mike (February 10, 2009). "Graham joins staff as coaching assistant". Boston.com Reiss' Pieces. Archived from the original on February 13, 2009. Retrieved February 24, 2009. ↑ Finn, Chad (February 5, 2009). "Patriots franchise Cassel". Boston.com Reiss' Pieces. Archived from the original on February 21, 2009. Retrieved February 28, 2009. 1 2 Gasper, Christopher L. (February 28, 2009). "Cassel is traded to Chiefs". The Boston Globe. Archived from the original on March 4, 2009. Retrieved February 28, 2009. ↑ Schefter, Adam (February 23, 2009). "Cassel's franchise tender submitted to NFL". NFL.com. Archived from the original on February 27, 2009. Retrieved February 28, 2009. ↑ Reiss, Mike (February 17, 2009). "Washington & Yates cut". Boston.com Reiss' Pieces. Archived from the original on February 21, 2009. Retrieved February 28, 2009. ↑ Reiss, Mike (February 19, 2009). "Billy Yates set to re-sign with Patriots". Boston.com Reiss' Pieces. Archived from the original on February 22, 2009. Retrieved February 28, 2009. ↑ Reiss, Mike (February 27, 2009). "Gaffney joins Broncos". Boston.com Reiss' Pieces. Archived from the original on March 4, 2009. Retrieved February 28, 2009. ↑ Reiss, Mike (February 27, 2009). "Lonie Paxton agrees with Broncos". Boston.com Reiss' Pieces. Archived from the original on March 2, 2009. Retrieved February 28, 2009. ↑ Gasper, Christopher L. (March 4, 2009). "Report: Jordan to the Broncos". Boston.com Reiss' Pieces. Archived from the original on March 9, 2009. Retrieved March 5, 2009. ↑ Reiss, Mike (March 5, 2009). "Heath Evans agrees to terms with Saints". Boston.com Reiss' Pieces. Archived from the original on March 6, 2009. Retrieved March 8, 2009. ↑ Gasper, Christopher L. (March 11, 2009). "Jets confirm Izzo signing". Boston.com Reiss' Pieces. Archived from the original on March 15, 2009. Retrieved March 14, 2009. ↑ Reiss, Mike (April 26, 2009). "Ellis Hobbs traded". Boston.com Reiss' Pieces. Archived from the original on April 29, 2009. Retrieved April 26, 2009. ↑ Young, Shalise Manza (June 4, 2009). "Rodney Harrison announces his retirement". The Providence Journal. Retrieved September 18, 2009. 1 2 Marvez, Alex (August 17, 2009). "Patriots trade DL Smith to hurting Broncos". Fox Sports. Retrieved August 17, 2009. ↑ Forsberg, Chris (August 25, 2009). "Patriots trade Hochstein to Broncos". Boston.com Reiss' Pieces. Retrieved August 25, 2009. ↑ Reiss, Mike (August 31, 2009). "Bruschi announces retirement". Boston.com Reiss' Pieces. Retrieved August 31, 2009. 1 2 Reiss, Mike (September 5, 2009). "Patriots making trades at tight end". Boston.com Reiss' Pieces. Retrieved September 6, 2009. ↑ Reiss, Mike (May 8, 2010). "Pats get upgraded draft pick". ESPNBoston.com. Archived from the original on May 10, 2010. Retrieved May 8, 2010. ↑ Reiss, Mike (September 6, 2009). "Seymour traded to the Raiders". Boston.com Reiss' Pieces. Archived from the original on September 9, 2009. Retrieved September 6, 2009. ↑ Reiss, Mike (February 27, 2009). "Patriots make Taylor signing official". Boston.com Reiss' Pieces. Archived from the original on March 2, 2009. Retrieved February 28, 2009. ↑ Schefter, Adam (March 5, 2009). "Patriots reach agreement with free-agent CB Springs". NFL.com. Archived from the original on March 6, 2009. Retrieved March 5, 2009. ↑ Gasper, Christopher L. (March 10, 2009). "Patriots agree to terms with Leigh Bodden". Boston.com Reiss' Pieces. Archived from the original on March 14, 2009. Retrieved March 11, 2009. ↑ Reiss, Mike (February 27, 2009). "Patriots close with TE Chris Baker". Boston.com Reiss' Pieces. Archived from the original on March 2, 2009. Retrieved February 28, 2009. ↑ Gasper, Christopher L. (March 14, 2009). "Galloway signing confirmed". Boston.com Reiss' Pieces. Archived from the original on March 17, 2009. Retrieved March 15, 2009. ↑ Gasper, Christopher L. (March 10, 2009). "Pats sign new long snapper". Boston.com Reiss' Pieces. Archived from the original on March 14, 2009. Retrieved March 11, 2009. ↑ Reiss, Mike (February 23, 2009). "Banta-Cain: 1-year deal". Boston.com Reiss' Pieces. Archived from the original on February 27, 2009. Retrieved February 28, 2009. 1 2 3 4 Gasper, Christopher L. (March 16, 2009). "Pats announce five signings". Boston.com Reiss' Pieces. Archived from the original on March 20, 2009. Retrieved March 17, 2009. ↑ Reiss, Mike (March 23, 2009). "Pats sign OL Damane Duckett". Boston.com Reiss' Pieces. Archived from the original on March 26, 2009. Retrieved March 23, 2009. ↑ Reiss, Mike (May 5, 2009). "Patriots moves". Boston.com Reiss' Pieces. Archived from the original on May 9, 2009. Retrieved May 26, 2009. ↑ Reiss, Mike (May 27, 2009). "Linebacker Paris Lenon joins Patriots". Boston.com Reiss' Pieces. Retrieved August 2, 2009. ↑ Reiss, Mike (February 26, 2009). "No tender for Alexander; 1-year deal instead". Boston.com Reiss' Pieces. Archived from the original on March 1, 2009. Retrieved February 28, 2009. ↑ Reiss, Mike (March 1, 2009). "James Sanders agrees to terms on 3-year deal". Boston.com Reiss' Pieces. Archived from the original on March 4, 2009. Retrieved March 3, 2009. ↑ Reiss, Mike (March 2, 2009). "Hochstein agrees to terms on 1-year deal with Patriots". Boston.com Reiss' Pieces. Archived from the original on March 6, 2009. Retrieved March 3, 2009. ↑ Reiss, Mike (March 5, 2009). "Patriots re-sign punter Chris Hanson". Boston.com Reiss' Pieces. Archived from the original on March 11, 2009. Retrieved March 8, 2009. ↑ Clayton, John (March 14, 2009). "Source: Pats ink Wright to 4-year deal". ESPN.com. Archived from the original on March 17, 2009. Retrieved March 14, 2009. ↑ Reiss, Mike (April 21, 2009). "Pierre Woods signs tender". Boston.com Reiss' Pieces. Archived from the original on April 24, 2009. Retrieved April 28, 2009. ↑ Reiss, Mike (April 22, 2009). "DL Kenny Smith signs". Boston.com Reiss' Pieces. Archived from the original on April 26, 2009. Retrieved April 28, 2009. ↑ Reiss, Mike (February 27, 2009). "Woods: 2nd round tender". Boston.com Reiss' Pieces. Archived from the original on February 28, 2009. Retrieved February 28, 2009. ↑ Reiss, Mike (August 25, 2009). "Patriots, LeVoir reach contract extension". Boston.com Reiss' Pieces. Retrieved September 6, 2009. ↑ Reiss, Mike (August 24, 2009). "Nick Kaczur's extension". Boston.com Reiss' Pieces. Retrieved September 6, 2009. ↑ Reiss, Mike (December 12, 2009). "Ninkovich latest to sign extension". ESPNBoston.com. Retrieved December 12, 2009. ↑ Rapoport, Ian (December 23, 2009). "Patriots OL Dan Connolly receives a contract extension through 2011". Boston Herald. Retrieved December 23, 2009. ↑ Reiss, Mike (October 19, 2010). "Aiken extended through 2011". ESPNBoston.com. Retrieved March 5, 2010. ↑ Reiss, Mike (November 23, 2009). "Extension for Eric Alexander". ESPNBoston.com. Archived from the original on November 28, 2009. Retrieved November 23, 2009. 1 2 Reiss, Mike (March 5, 2009). "Report: Patriots acquire WR Greg Lewis". Boston.com Reiss' Pieces. Retrieved March 5, 2009. 1 2 Bowen, Les (March 5, 2009). "GLew Outta Here". Philadelphia Daily News. Archived from the original on March 6, 2009. Retrieved March 5, 2009. ↑ Reiss, Mike (April 30, 2009). "Patriots acquire TE Smith from Buccaneers". Boston.com Reiss' Pieces. Archived from the original on May 2, 2009. Retrieved April 30, 2009. ↑ Reiss, Mike (May 3, 2009). "Pats shipped 2010 fifth-rounder for Smith". Boston.com Reiss' Pieces. Archived from the original on May 6, 2009. Retrieved May 3, 2009. ↑ Gasper, Christopher L. (September 5, 2009). "Alex Smith released". Boston.com Reiss' Pieces. Retrieved September 5, 2009. ↑ Reiss, Mike (September 7, 2009). "WR Greg Lewis released". Boston.com Reiss' Pieces. Retrieved September 7, 2009. ↑ Reiss, Mike (August 6, 2009). "Burgess trade terms". Boston.com Reiss' Pieces. Retrieved August 7, 2009. ↑ Rapoport, Ian (October 20, 2009). "Bill Belichick on Joey Galloway's release: "We moved on on that one… It just didn't work out."". Boston Herald. Archived from the original on October 21, 2009. Retrieved October 20, 2009. ↑ Gasper, Christopher L. (September 22, 2009). "Pats trade for LB Burgess". Boston.com Extra Points. Retrieved September 22, 2009. ↑ Gasper, Christopher L. (September 28, 2009). "Patriots sign DT Terdell Sands, release LB Prescott Burgess". Boston.com Extra Points. Retrieved September 28, 2009. ↑ Game moved from 8:15 pm on NBC to 1:00 on CBS under NFL "flex scheduling" rules – Reiss, Mike (November 24, 2009). "Pats-Dolphins game moved to 1 pm". ESPNBoston.com. Retrieved November 24, 2009. ↑ "'Hey, it's Rex': Jets coach calls fans for help". ESPN.com. Associated Press. September 16, 2009. Retrieved September 20, 2009. ↑ Benbow, Julian (September 17, 2009). "Maroney ready for a dogfight with Jets". The Boston Globe. Retrieved September 20, 2009. 1 2 3 4 5 6 7 8 9 10 "Game Notes: Patriots vs. Titans". New England Patriots. October 18, 2009. Retrieved October 22, 2009. ↑ "Game Notes: Patriots vs Jets". New England Patriots. November 22, 2009. Archived from the original on January 13, 2010. Retrieved November 29, 2009. ↑ "Game Notes: Patriots at Saints". New England Patriots. November 30, 2009. Retrieved December 1, 2009. ↑ "Game Notes: Patriots at Dolphins". New England Patriots. December 6, 2009. Retrieved December 8, 2009. ↑ Kilgore, Adam (January 4, 2010). "A mess in Texas". The Boston Globe. Archived from the original on January 19, 2010. Retrieved January 4, 2010. ↑ Reiss, Mike (November 25, 2009). "Bodden is Defensive Player of the Week". ESPNBoston.com. Archived from the original on December 1, 2009. Retrieved November 25, 2009. ↑ "QB Tom Brady named AFC Offensive Player of the Week". Patriots.com. September 16, 2009. Retrieved September 16, 2009. ↑ Petraglia, Mike (October 20, 2009). "Brady AFC Offensive Player of Week". WEEI.com. Retrieved October 20, 2009. ↑ Pepin, Matt (October 29, 2009). "Brady named AFC Offensive Player of the Month". Boston.com Extra Points blog. Retrieved October 29, 2009. ↑ Reiss, Mike (December 30, 2009). "Brady named AFC Offensive Player of Week". ESPNBoston.com. Archived from the original on January 2, 2010. Retrieved December 30, 2009. ↑ Reiss, Mike (December 24, 2009). "Brady earns Ed Block Courage Award". ESPNBoston.com. Archived from the original on December 30, 2009. Retrieved December 30, 2009. ↑ "Brady named Comeback Player of the Year". NBC Sports. Associated Press. January 6, 2010. Retrieved January 6, 2010. ↑ Reiss, Mike (December 24, 2009). "Brady earns Ed Block Courage Award". ESPNBoston.com. Archived from the original on December 28, 2009. Retrieved December 25, 2009. ↑ Reiss, Mike (November 11, 2009). "Gostkowski gets AFC special teams honor". ESPNBoston.com. Archived from the original on November 20, 2009. Retrieved November 11, 2009. ↑ Price, Christopher (October 28, 2009). "Meriweather wins AFC weekly honor". WEEI.com. Retrieved October 28, 2009. ↑ Reiss, Mike (December 29, 2009). "Pro Bowlers: Wilfork, Mankins, Brady & Welker". ESPNBoston.com. Archived from the original on December 31, 2009. Retrieved December 29, 2009. ↑ Reiss, Mike (January 8, 2010). "Moss, Meriweather added to Pro Bowl roster". ESPNBoston.com. Archived from the original on January 10, 2010. Retrieved January 8, 2010. ↑ Reiss, Mike (January 20, 2010). "Brady pulls out of Pro Bowl". ESPNBoston.com. Archived from the original on January 23, 2010. Retrieved January 20, 2010. ↑ Pepin, Matt (January 14, 2010). "Welker named to AP's All-Pro team". The Boston Globe. Archived from the original on January 16, 2010. Retrieved January 14, 2010.